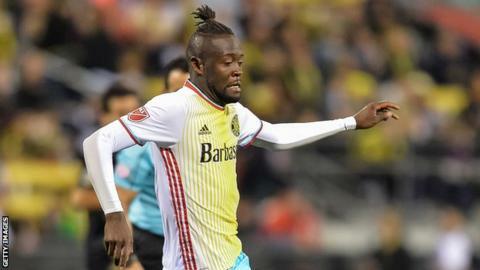 Sierra Leone's Kei Kamara has been traded by Columbus Crew to MLS rivals New England Revolution in the USA. The move comes just days after Kamara was suspended for an on-field spat with team-mate Frederico Higuain. The 31-year-old had signed a contract extension with Columbus 10 weeks ago. "It's a shock to me and my family. I have done nothing but good on and off the field for Columbus. But my journey continues and this time is for New England Revolution," Kamara said. Columbus coach Gregg Berhalter said: "Our actions will always reflect the values of our club and we believe this transaction will improve our competitiveness this year and in future years." Kamara was given a one-match ban by his club after he argued with Higuain and criticised him in press conference over who should take a penalty against Montreal Impact on Saturday. Having already scored twice, Kamara wanted to take the spot-kick for the chance to complete his hat-trick but Higuain took the ball instead and scored to give his side a 4-1 lead. Despite the lead Montreal came back to earn a 4-4 draw. Kamra went on to publicly disagree with his ban and insisted he had no regrets over his actions and his comments. Berhalter said it had not been an easy decision to make. "Kei had a memorable 2015 season and we recognise and understand how popular and productive he was, so this decision was not one we made lightly," he said. He recorded 22 regular-season goals in MLS last year finishing joint-top scorer with the Giovinco but lost out the golden boot to the Italian who provided more assists. He was top scorer in the play-offs, hitting four goals to take his season's tally to 26. Among his honours in 2015 were Columbus Crew's player of the season award and being named in the MLS best XI. The Revolution will be his fifth MLS club after Columbus Crew, San Jose Earthquakes, Sporting Kansas City and Houston Dynamo.